Robbie Deans is expected to omit Quade Cooper from his initial 25-man Wallabies squad to face the British & Irish Lions, but Israel Folau, George Smith and injury-plagued pair Pat McCabe and Berrick Barnes are set to be named on Sunday afternoon. Cooper has been in excellent form recently in Super Rugby, and he has a well-grooved combination with indispensable half-back Will Genia, but the 38-Test five-eighth still appears to be on the outer because of his "toxic" comments last September and his defensive positioning at fullback for the Reds. James O'Connor remains the frontrunner to wear the No. 10 jersey for the first Test on June 22.
Cooper, however, is believed likely be one of six players, perhaps with suspended Kurtley Beale, added to a final 31-man squad on June 11 - three days after he can show his wares for Queensland Reds against the British & Irish Lions in their June 8 tour match. Deans, meanwhile, is expected to select tried-and-trusted favourites McCabe and Barnes on Sunday, despite each making only one run-on start this year in their respective returns from injury. The pair were among the Wallabies leadership group last season, and are still viewed as key incumbents. Beale currently is in a rehabilitation centre to deal with his alcohol issues, but he also retains distinct hope of starting at fullback against the Lions. Newly appointed coaching consultant Nathan Sharpe, who captained the Wallabies late last year when Beale stepped up admirably at five-eighth, said as much on Thursday night. "He comes back and plays well, I've got no doubt they will consider him there," Sharpe said on Fox Sports' Rugby HQ program. Uncapped playmaker Christian Lealiifano is set to be a back-up to O'Connor and McCabe at No. 10 and No. 12, while fellow Brumbies Nic White and Joe Tomane also seem to have played themselves into the squad as backline back-ups. And Israel Folau, hailed by Deans as a future great if he stays in the code, has leapfrogged Jesse Mogg as a fullback/wing prospect with his barnstorming form over the past month. Up front, Deans can crucially select a full-strength pack - apart from a season-ending injury to flanker David Pocock - against the experienced Lions forwards. George Smith is seen as the leading candidate to wear the No. 7 jersey ahead of Michael Hooper and Liam Gill, with Gill in danger of missing the initial squad in spite of his fine form. Scott Higginbotham and Wycliff Palu seem certain selections, but Brumbies skipper Ben Mowen and New South Wales Waratahs captain Dave Dennis are battling for a backrow place - and their form in Saturday night's grudge match could be influential. The Waratahs, to provide their entire front-row, are set to be the most represented province with nine players, while the table-topping Brumbies may provide eight and the Reds six. Props: Benn Robinson, Ben Alexander, James Slipper, Sekope Kepu. Hookers: Stephen Moore, Tatafu Polota-Nau. Locks: James Horwill, Sitaleki Timani, Rob Simmons. Backrowers: Scott Higginbotham, George Smith, Michael Hooper, Wycliff Palu, Ben Mowen. Half-backs: Will Genia, Nic White. Five-eighths: James O'Connor, Christian Lealiifano. Centres: Pat McCabe, Adam Ashley-Cooper, Ben Tapuai. Wingers: Digby Ioane, Joe Tomane. Fullbacks: Berrick Barnes, Israel Folau. 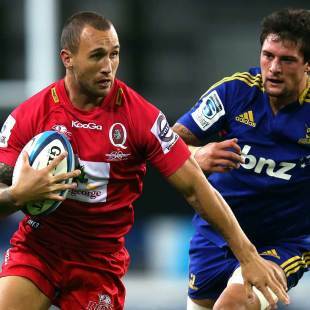 Would you pick Quade Cooper to face the British & Irish Lions? Leave a comment below to join the conversation.